Aravis-120 is an Inherent protective fabric made of 50% Meta Aramid / 50% FR-Viscose, with a weight of 120 gsm. It comes in a plain 1/1 weave. Aravis FR-liner is designed for fire fighter turnout gear with a new level of moisture management properties. It is light, thin and inherently flame resistant. The purpose of thermal liner is to be used as a part of 4-layer sandwich for firefighter`s turnout gear. Aravis-120 FR-liner provides comfort for the wearer as it thin and light (120 gsm). At the same time Aravis-120 transports perspiration away from skin. The blend of aramid and viscose fibers makes Aravis-120 very durable. It also gives high level of thermo-protection, due to its inherent Flame Retardant properties. Artex-150 is an inherent protective fabric made of 93% Meta-Aramid, 5% Para-Aramid, 2% Antistatic, with a weight of 150 gsm. It comes in a plain 1/1 weave. 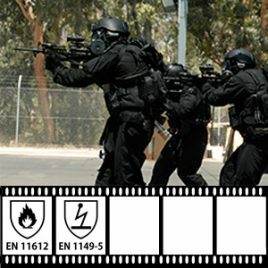 Artex-150 is an innovative inherent flame resistant fabric for protective and fr clothing. This fabric is best used for emergency services (EMS clothing), for firefighters gear as well as for special forces, for marines uniform, for military pilots flight suits. Artex-150 is also suitable for FR bibs and FR overalls for workers in the oil and gas, chemical and power industries. Artex-150 fabric provides protection against Fire, open Flame and Electric Arc. Inherent thermal protection cannot be washed away. The fabric is very durable and super-resistant to abrasion. Between other features of Artex-150 are light weight and good breathability, which gives extra comfort to the wearer. Due to integrated carbon antistatic yarn, Artex prevents building up electrostatic discharge (ESD) and eliminates the possibility of explosion in oil, gas and other industries. Artex-150 has been certified in BTTG (UK) lab to ISO 11612 standard. Artex-180 is a Flame Resistant 180gsm fabric made of inherently non-flammable aramid fibers with 93% Meta-Aramid, 5% Para-Aramid, 2% Antistatic in twill 2/1 weave. Artex-180 is an innovative inherent flame resistant fabric for protective and fr clothing. This fabric is best used for emergency services (EMS clothing), for firefighters gear as well as for special forces, for marines uniform, for military pilots flight suits. Artex-180 is also suitable for FR bibs and FR overalls for workers in the oil and gas, chemical and power industries. Artex-180 fabric provides protection against Fire, open Flame and Electric Arc. Inherent thermal protection cannot be washed away. The fabric is very durable and super-resistant to abrasion. Between other features of Artex-180 are light weight and good breathability, which gives extra comfort to the wearer. Due to integrated carbon antistatic yarn, Artex prevents building up electrostatic discharge (ESD) and eliminates the possibility of explosion in oil, gas and other industries. Artex-180 has been certified in BTTG (UK) lab to ISO 11612 and EN 1149-5 standards. Artex-210 is an inherent protective fabric made of 93% Meta-Aramid, 5% Para-Aramid, 2% Antistatic, with weight of 210 gsm, twill 2/1 weave. Artex-210 is an innovative inherent flame resistant fabric for protective and fr clothing. This fabric is best used for emergency services (EMS clothing), for firefighters gear as well as for special forces, for marines uniform, for military pilots flight suits. Artex-210 is also suitable for FR bibs and FR overalls for workers in the oil and gas, chemical and power industries. Artex-210 fabric provides protection against Fire, open Flame and Electric Arc. Inherent thermal protection cannot be washed away. The fabric is very durable and super-resistant to abrasion. Between other features of Artex-210 are light weight and good breathability, which gives extra comfort to the wearer. Due to integrated carbon antistatic yarn, Artex prevents building up electrostatic discharge (ESD) and eliminates the possibility of explosion in oil, gas and other industries. Artex-210 has been certified in BTTG (UK) lab to ISO 11612, ISO 11611, EN 1149-5, EN 15614. Artex-210 has been certified in AITEX (Spain) lab to EN 469. Water-oil-acid repellent Artex-260 is an inherent protective fabric made of 93% Meta-Aramid, 5% Para-Aramid, 2% Antistatic, with a weight of 260 gsm, having a twill 2/1 weave. Artex-260 is an innovative inherent flame resistant fabric for protective and fr clothing. 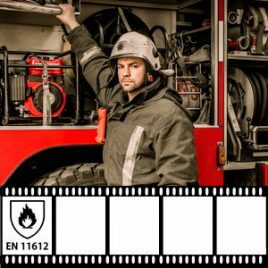 This fabric is best used for emergency services (EMS clothing), for firefighters gear as well as for special forces, for marines uniform, for military pilots flight suits. Artex-260 is also suitable for FR bibs and FR overalls for workers in the oil and gas, chemical and power industries. Artex-260 fabric provides protection against Fire, open Flame and Electric Arc. Inherent thermal protection cannot be washed away. The fabric is very durable and super-resistant to abrasion. Between other features of Artex-260 are lightweight and good breathability, which gives extra comfort to the wearer. Due to integrated carbon antistatic yarn, Artex prevents building up electrostatic discharge (ESD) and eliminates the possibility of explosion in oil, gas and other industries. Artex-180 has been certified in BTTG (UK) lab to ISO 11612 and ISO 11611 standards. M-ACRYX-240 is a Modacrylic Flame Retardant fabric. Modacrylic fibers have been developed recently and became very popular for FR-fabrics used for protective or FR clothing. M-ACRYX-240 is a lightweight and soft, with a wool-like feel modacryl fabric. It has excellent colorfastness, shrinkage and wrinkle resistance. M-ACRYX-240 is inherently flame resistant and do not combust. Modacrylic fibers are difficult to ignite and Modacrylic fabric will self-extinguish after attempt of ignition. Modacrylic fibers also have great dimensional stability and high elastic recovery, which gives them the ability to hold their shape. Antistatic yarn, which interlocked in M-ACRYX-240 fabric makes it absolutely safe for use in explosive atmospheres. To prevent electrostatic discharge (ESD) sparks, antistatic fibers safely discharge static electricity eliminating the risk of fire and explosion. To download a Certificate or a Technical specification, please click on a tick ( ) in the table below. Mobile version of this table is better to view in the horizontal mode. Artex fabrics are innovative inherent flame retardant fabrics made of blended aramid fibers in composition of 93% Meta-Aramid, 5% Para-Aramid, 2% Antistatic. Inherent thermal, flame and electric arc protection cannot be washed away. This property of aramid fibers is built into their chemical structure. Garments made with aramid fabrics are not flammable. When exposed to flame, the aramid fiber swells and becomes thicker, forming a protective barrier between the heat source and the skin. This protective barrier stays supple until it cools down, giving the wearer vital extra seconds of protection to escape. Artex aramid fabrics are very durable, have high tensile resistance and light weight. FR-inherent and Lightweight – our Artex aramid fabrics are made of synthetic fibers which are inherently (i.e. from the very creation) flame retardant. Reputable and well- tried composition of meta and para-aramid with antistatic provides excellent protection from heat and flame. Internationally Certified – our Artex aramid fabrics have been certified to main European and American standards. We have done this extensive testing for each of our fr-fabrics in first class world laboratories such as BTTG (UK), Kinectrics (Canada), Vartest (USA), AITEX (Spain), UL (USA). All the Certificates are available on our website. Proven Protection – IS0 11612 / ISO 11611, EN 61482-1-2, ISO 1149-3 – these are the standards, to which we have successfully tested our Artex aramid fabrics. FR-properties are embedded in the very fibers and can not be ever washed away. FR-inherent properties can not be compromised by even some improper washing method, what gives you extra confidence about your fr-garments. Longer Life of FR-garment and better Colourfastness – using protective garments made with our XM FireLine Artex aramid fabrics you have a super protection for reasonable price. Due to use of solution dyed (dope dyed) yarn our fabrics keep the original colors during years even after multiple industrial washings. Areas of use of aramid protective clothing are very diverse. Between them are flight suits for Air-force pilots, combat jackets and pants for Army, Navy and Police, especially for special forces like SWAT, Navy Seals and other elite squats. Another popular use of aramid fabrics is as Station uniform for firefighters. Artex aramid fabrics are also can be used as coveralls in Auto or Moto-sport or as bibs, overalls, shirts, pants and jackets in Electric companies. Multi-layer (so called Sandwich) aramid costumes are used for some high-voltage works (HRC 3 and HRC 4 with ATPV > 40 cal/cm2). Sandwich aramid construction is also used for Wildland and Structural firefighting as turnout or bunker gear.